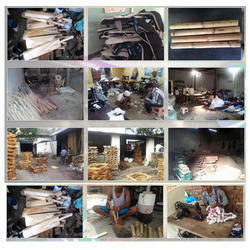 Since its commencement in 2010, SAG is instrumental in the manufacturing and wholesaling of Cricket Bats & Leather Balls. Being a quality oriented firm, we provide best quality products which include Cricket Bats, Leather Balls and Batting Gloves. We have acquired the acclamation as the market leader in this sector by providing various unparalleled designs and setting-up superior children’s outdoor equipment in public & private parks, residential projects, schools, clubs, NGOs, etc. Our expertise and experience in the products and business will ensure your success. Our mission is to be a reason for the smile, be a symbol for change, and be a sponsor for solutions. As a customer focused organization, we manufacture all our products to meet the desired quality, durability, functional and safety standards. We have built efficient state-of-art infrastructure facility for the smooth and hassle-free functioning of the unit. All these departments are managed by our highly experienced professionals that maintain proper coordination among them to ensure the organized functioning of entire business operation. Moreover, our vast industrial knowledge and experience give us a competitive edge of manufacturing safe playing equipment which undergoes stringent quality checks. Manufactured using high-grade raw material, our products are appreciated for their high efficiency, stupendous performance, and reliability. Under the leadership and technical guidance of Mr. Rahul Agarwal we have conquered many benchmarks of success. His vision is to progress as a high-quality organization and maintain the status of customer oriented organization facilitating superior quality products and services. Our well integrated infrastructural facility is installed with all kinds of machines as well as equipment that help us in meeting ever-changing requirements of our customers. We are equipped with advanced bending, cutting, notching, and other special purpose machines. Further, our infrastructure also comprises several other departments like R & D, quality testing, storage, packaging, etc. Our excellent production facilities help us move ahead and enable us in providing best in class range of high precision Cricket Bats & Leather Balls to our esteem clients.